I want to give my children the opportunity of a good education. After feeding them and clothing them, sometimes, the cost is greater than my budget. This isn’t the case with KinderBach. 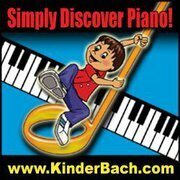 “KinderBach provides a solid music foundation for the children while, at the same time, overlapping and enhancing basic math and language skills.” Designed for beginners, ages 3-7. It is good education. Karri Gregor is the fun, energetic author, illustrator and educator of KinderBach. She uses memorable piano pals, Frisco, Dodi, and friends, to teach note reading, rhythm, singing, composition, and more, reinforcing the value of each lesson with coloring pages, worksheets, and games. Piano for young children. The lessons are child-friendly, quick and easy! More than 240, 10 minute lessons, achieving 6 levels. DVD/CD packages starting at $40.45 +s/h or an instantly accessible online subscription for $95.88 per year. That makes it good education within budget! That’s just $7.99 per month or less than 30 cents a day for a music tutor, no scheduling conflicts and no gas money. I didn’t even factor in the 30% off you can get, until February 2013, when you use coupon code TOScrew2012. I first discovered KinderBach last year, and since then there have been some exciting changes. You can still use the program on your computer, even streaming to your TV, but now, you can also use it with iPad, Android Tablet, Nook, or Kindle Fire! They still have their 30 Day Money Back Guarantee, plus all DVD’s & CD’s have a lifetime replacement if damaged for any reason. There’s really no risk because KinderBach also offers a two week free trial, before you pay for anything. Take a few minutes to follow the links I’ve posted here, to the KinderBach website. It’s simple to navigate and full of great information! Still have Comments or Questions? You can also choose from nearly a hundred other reviews, viewpoints, written by my crew mates, when you click the graphic below. I think learning is simply fun and affordable with KinderBach at Home.